Spicer's Holiday House is a new renovated and refurbished Georgian house. It is beautifully decorated and very well equipped with everything you will need when staying away from home. A huge kitchen dining room with large range, fridge freezer, dishwasher and plenty of cooking equipment and utensils. A relaxing comfortable sitting room and fun games room both with TVs means that you can separate yourselves if you so wish. All the 4 bedrooms are large and airy and are all ensuite. You won't find a more comfortable house to rent in Wells-next-the-Sea! There is off road parking for one car and a lovely sun-trap of a courtyard garden, safe for children to play in. Minutes from all the amenities of Wells and the Quay, in spitting distance of The Globe Inn it is a one-mile walk/drive from the gorgeous Holkham beach with the pinewoods and all the lovely beach huts! If bird watching or walking are your things, look no further . . .
Spicer's Holiday House is a new renovated and refurbished Georgian house. It is beautifully decorated and very well equipped with everything you will need when staying away from home. 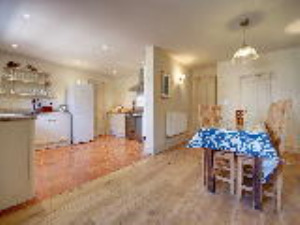 A huge kitchen dining room with large range, fridge freezer, dishwasher and plenty of cooking equipment and utensils. A relaxing comfortable sitting room and fun games room both with TVs means that you can separate yourselves if you so wish. All the 4 bedrooms are large and airy and are all ensuite. You won't find a more comfortable house to rent in Wells-next-the-Sea! There is off road parking for one car and a lovely sun-trap of a courtyard garden, safe for children to play in. Minutes from all the amenities of Wells and the Quay, in spitting distance of The Globe Inn it is a one-mile walk/drive from the gorgeous Holkham beach with the pinewoods and all the lovely beach huts! If bird watching or walking are your things, look no further . . . Children welcome from any age.